A reliable source for Wet Dust Collectors information and a resource for accessing leading Wet Dust Collectors and suppliers. Wet Dust Collectors Dusting is often thought of as a causal household task, but this practice is also quite important to the upkeep of industrial and commercial processes and the health of the workers performing said processes. All varieties of wet dust collectors have one of three basic configurations: gas-humidification, gas-liquid contact (inertial impaction, interception, diffusion or condensation nucleation) or gas-liquid separation. After dust collection, the "cleaned" or "scrubbed" gases are normally passed through a demister to remove the added water droplets. Afterwards, the dirty water is either cleaned and discharged or recycled to the dust collector. Dust is removed using a clarification unit or drag tank chain, the latter of which will remove the sludge and deposit it in a dumpster or stockpile. There exist multiple types of wet dust collectors, categorized by pressure drop. They are as follows: low-energy collectors (0.5 to 2.5 inches water gauge and 124.4 to 621.9 Pa), low-to-medium energy collectors (2.5 to 6 inches water gauge and 0.622 to 1.493 kPa), medium-to-high energy collectors (6 to 15 inches water gauge and 1.493 to 3.731 kPa) and high-energy collectors (greater than 15 inches water gauge and greater than 3.731 kPa). 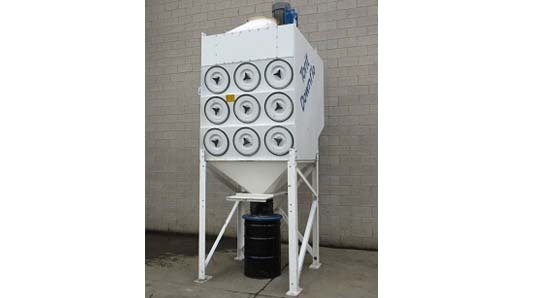 One type of low-energy wet dust collector is the gravity-spray-power scrubber. This scrubber collects atomized liquid droplets that form in its spray nozzles, which then fall through rising exhaust gases. Dirty water is drained at the bottom. Gravity-spray-power scrubbers are approximately 70% efficient on 10 µm particles, and work poorly under this threshold. They do, however, treat relatively high dust concentrations without clogging. An example of the low-to-medium energy wet dust collector is the wet cyclone, which uses centrifugal force to spin dust particles, throwing them onto its wetted wall, where the dust is then washed away by water introduced from the top. These collectors operate efficiently for 5 µm particles and above. 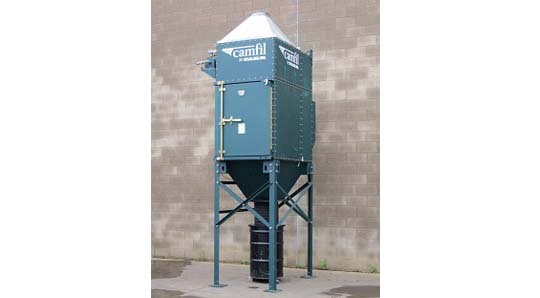 Markets for wet dust collectors include woodworking, food processing, foundry, material handling, building restoration, plastics and resins, and much more.